Plush Sheraton Sweet Sleeper Beds a 20-meter outdoor pool and Great America four miles away pamper our guests at the non-smoking Sheraton Sunnyvale Hotel. The Sheraton is housed in a two-story building in a leafy resort-style setting. The 173 spacious upscale rooms are decorated in a relaxing color palette. Amenities include coffee/tea makers Wi-Fi (for a fee) and flat-panel LCD TVs with HD channels and premium cable. A good night's sleep comes courtesy of the ultra-comfy Sweet Sleeper Bed with thick plush-top mattress and 300-thread-count cotton sheets. Some rooms have poolside garden or gazebo views. Unlike most hotel pools the Sheraton's at 20 meters in length allows you to enjoy a serious swim. The pool is open year-round and heated seasonally. The hotel also has free parking a 24-hour fitness facility a Mediterranean-style restaurant a lounge and a lobby business center and communal area. There is a free airport shuttle. 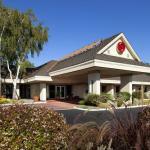 The Sheraton is off Hwy 237 four miles west of California's Great America. If you're driving from Norman Y. Mineta San Jose International Airport the hotel is eight miles northwest.